After almost two years of working on the project, former U.S. Navy Blue Angels Commanding Officer Captain Ryan Bernacchi tells NewsRadio that the Navy does intend to switch to the Super Hornet, hopefully making the change during Winter training 2020/2021 for use in the 2021 show season. He and former two-time Blue Angel Commander Frank Weisser have been studying all the alternatives involved in this major change, and this is the option that makes the most sense. There have been many reports and retractions surrounding this potential change, but with the conclusion of their exhaustive study, this is the current plan. However, Bernacchi notes fleet readiness priorities could always push back the timetable. Now that the Navy has officially retired the legacy Hornets on Friday, many expected some of those jets to go to the Blues. However, since the Marines, Reserves, and training units still use them, this will not be the case. But unlike previous Blues jets, the ones coming to the Team will not need to come from the fleet. That’s because the plan is to convert eleven Lot 21 and 22 Super Hornets (“Rhinos”) that were part of the LRIP (Low Rate Initial Production) run and never developed for combat implementation. These early run Rhinos have in essence been waiting for a use like this, which coincides nicely with the intended transition by the Blue Angels. As far as the flight demonstration goes, Bernacchi says there are no maneuvers the Hornet performs that the Rhino cannot. 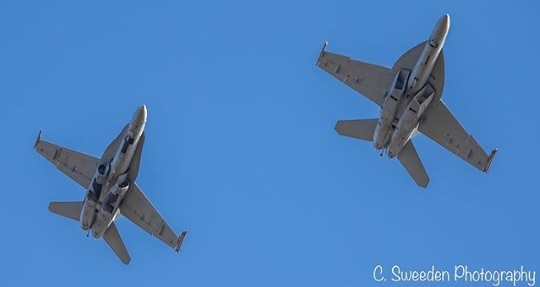 However, he says the show may be slightly shorter, not because of any limitation of the Super Hornets, but mostly because it will work better with the airshow community and (more importantly) greatly reduce the stress on the airplanes, giving them a much longer lifespan. Photo courtesy of Courtney Sweeden.